Hartford, CT…Permatex® will be displaying the Polimotor 2 during the 2018 AAPEX Show at booth 3418. Permatex has applied its innovative leadership in chemical technology for automotive maintenance and repair to help Polimotor LLC and its founder, Matti Holtzberg, a leading authority on polymer engine technology, develop the next generation of polymer engines. Permatex Sealants and Gasket Makers are used to seal the Polimotor 2 revolutionary polymer engine. The Polimotor 2 engine was designed with fiber reinforced polymer engine parts that are used in place of some traditional metal components, in order to reduce weight. Weight reduction is a critical factor in both racecars and everyday vehicles in order to maximize fuel economy and horsepower. The assembly of these new components requires innovative techniques to assure leak proof assemblies and fail proof performance. To accomplish this, the Polimotor team is using Permatex Sealants and Gasket Makers in place of traditional pre-formed gaskets on all engine applications except the head gasket. In 1972, Matti Holtzberg established Polimotor Research to develop fiber reinforced polymers that could be used to replace metal parts in internal combustion engines. Ahead of its time in 1980, he successfully created Polimotor 1, the world’s first polymer engine. 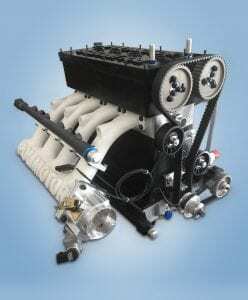 Holtzberg designed and developed the Polimotor based on a Ford 2000cc engine with cast iron block. His polymer design weighed just 168 lbs., about half the weight of the metal engine, and produced 280 BHP at 8500 RPM. In 1985, Holtzberg shocked the global automotive industry and motorsports world by successfully competing in the IMSA Camel GT Championship as well as other notable racing venues with what was essentially the world’s first polymer racing engine. In response to the growing demand for lighter and more fuel-efficient cars from global automakers, Holtzberg has taken his design to the next level and created Polimotor 2, using his latest fiber reinforced polymer materials for manufacturing engine blocks. The Polimotor 2’s polymer engine block, oil pan, cam box, and cam cover are molded using a fiber-reinforced thermoset molding compound and a molding process developed by Holtzberg. The Polimotor 2 block weighs 6 Kg less than Ford’s latest Ecoboost 2.0 aluminum block. In addition to Permatex, other key automotive manufacturers have also joined the Polimotor team including: Solvay, PolyOne, Toho Tenax, AGY, Mobil 1, and Mahle. Permatex is a leading manufacturer, distributor, and marketer of premium chemical products to the automotive maintenance and repair markets. Since 1909, Permatex has been an acknowledged leader in the development of innovative new products and services for the automotive aftermarket. Permatex markets a wide range of products under well-known ITW brand names such as Permatex®, Fast Orange®, Spray Nine®, The Right Stuff®, Threadlocker Gel Twist®, and Grez-Off®. Permatex currently operates in the United States, Canada, Mexico, and the U.K. and exports products to more than 85 countries around the world. North American operations include Permatex’s headquarters in Hartford, CT and a state-of-the-art manufacturing, distribution, and technical center located in Solon, OH. Questions about our products? How to use them? Comments on our products? ITW Global Brands, specializes in servicing the auto aftermarket with pride.